On February 27, Congresswoman Pramila Jayapal (D-Washington) introduced H.R. 1384, To establish an improved Medicare for All national health insurance program. On April 10, Senator Bernie Sanders (I-Vermont) introduced a companion bill in the Senate, S. 1129. Call your Member of Congress NOW at (202) 858-1717 and tell them to co-sponsor H.R. 1384. The bill will guarantee quality, therapeutic care to every person in the United States. There will be no premiums, no co-pays and no deductibles—and no charges whatsoever at the point of service. The bill preserves the ability of veterans to receive their medical benefits and services through the Veterans Administration if they wish, and of Native Americans to receive their medical benefits and services through the Indian Health Service, if they wish. 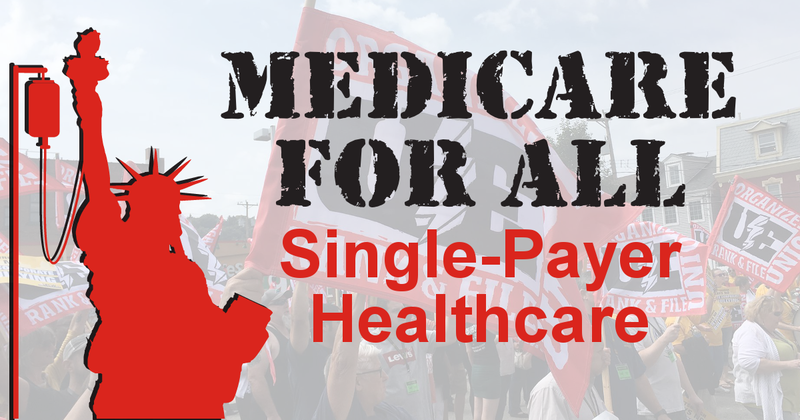 We are in a historic moment in the movement for Medicare for All single-payer healthcare. A record number of House candidates ran on Medicare for All in the midterm elections, and we now have record high support among the public. Call your Representative NOW at (202) 858-1717 and ask them to sign on. Then get your co-workers, friends and family to call.